Stickers are one of the most versatile branding materials. If done effectively, they can give your product a creative and vibrant appeal that makes your product stand above the rest. Oval stickers are also very popular as decals and giveaways during events, gigs, fairs and festivals. With their adhesive backing, recipients can immediately stick one on something and start enjoying (and advertising). Overall, they are made to get noticed, which is always what you want out of your advertising. Not to mention they are printed at a very affordable price. Create your custom oval stickers with NextDayFlyers. With several materials and sizes to choose from, you can find a combination that fits your needs. 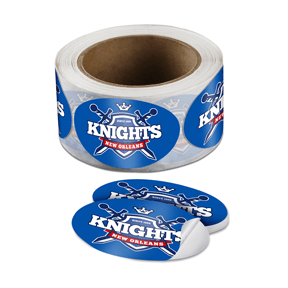 Choose between cut-to-size or roll stickers, with sizes ranging from .75" x 1.5" to 4" x 6". Then select the best material, keeping in mind if you'll be using them indoors, outdoors, or both. All of our stickers are printed in full color with your choice of coating: gloss, matte, or none. Order from 100 to 100,000 at once. Send us your design today for proofing, then expect your project as soon as the next day. Oval Stickers is rated 4.8 out of 5 by 4. Rated 4 out of 5 by jhughes23 from they made a mistake and corrected it in 2 days! Great product and company. They sent the wrong stickers and corrected it and had the proper ones to me in 2 days. Stickers are of great quality too. Rated 5 out of 5 by Mr 518 Sneaker Fest from Very satisfied I bought the stickers for my sneaker event this month and I am very pleased with the quality and how quickly I received them!! Rated 5 out of 5 by ACCS from Awesome as ALWAYS Have been using this company for 4 years and always on time and order was perfect! I wish I could use them more! Prices are fantastic, service is spectacular! You would be a fool not to use them.